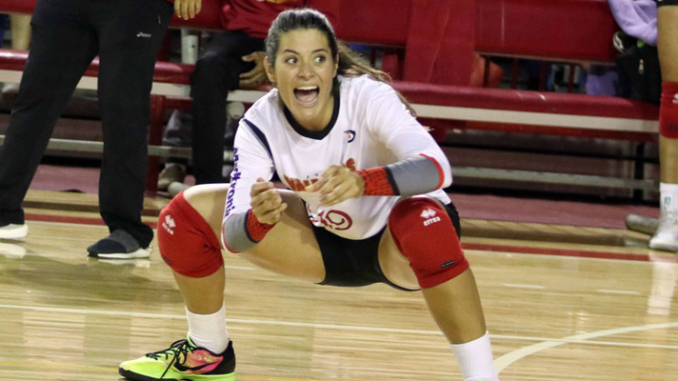 SAN JUAN, Puerto Rico, April 9, 2019 – Opposite player Paulina Prieto of Valencianas de Juncos was the Most Valuable Player of Week 11 to close the regular series of the Puerto Rican Women’s Volleyball Superior League. Prieto totaled 55 points in 11 sets played during the week by Valencianas winners of three matches, including two against Naranjito and Mayaguez their quarterfinals rivals. Prieto, playing in her second season in the league, was the scoring leader of the regular season with 497 points and also led in attacks with 444. Karina Ocasio of Caguas was second in scoring and attacks with 482 and 386, respectively. The leader in blocks was Neira Ortiz of Polluelas of Aibonito with 84 ‘walls’, followed by Ivonessa García (Juncos) with 77, Amanda Vázquez (Mayagüez) with 75, and Alba Hernández (Trujillo Alto) with 74. Debora Seilhamer of Aibonito once again was the best libero of the year dominating in effectiveness (11.19), 547 digs and 460 passes. Kathia Sánchez of Mayaguez was the top setter with 530 assists while Andrea Rangel was the leader in aces with 51. Ocasio repeated as wing spiker in the Ideal Team of the Week. She was elected for the fifth consecutive week and eighth overall. Kanisha Jiménez of Toja baja was the other wing spiker and Prieto the opposite. Amanda Vásquez (Mayaguez) and Lynda Morales (Juncos) were the top middle blocker with newcomer Mariana Thon (Juncos) as setter. Xaimara Colón (Juncos) was the libero.